I swear I got goosebumps the first time I saw the trailer. But what caught my eye the most was the glimpse of the new droid, BB-8. At first, I thought it was a head rolling on a soccer ball, but it’s not. 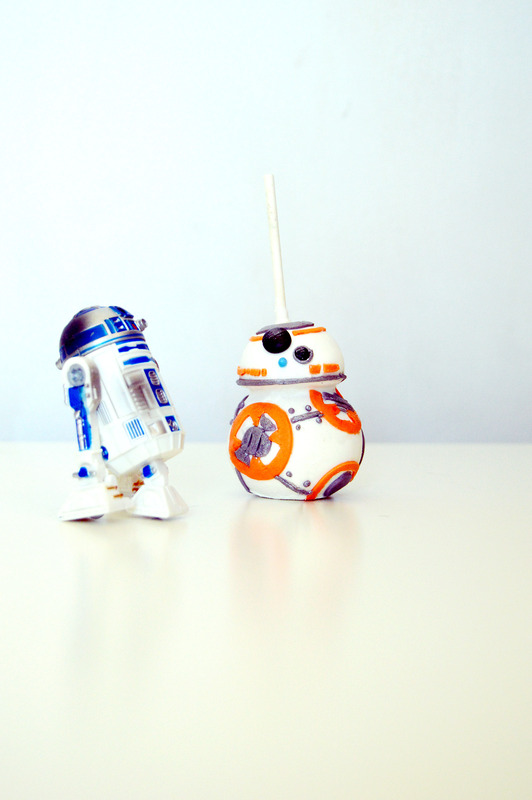 It’s a droid and a really cute one too. 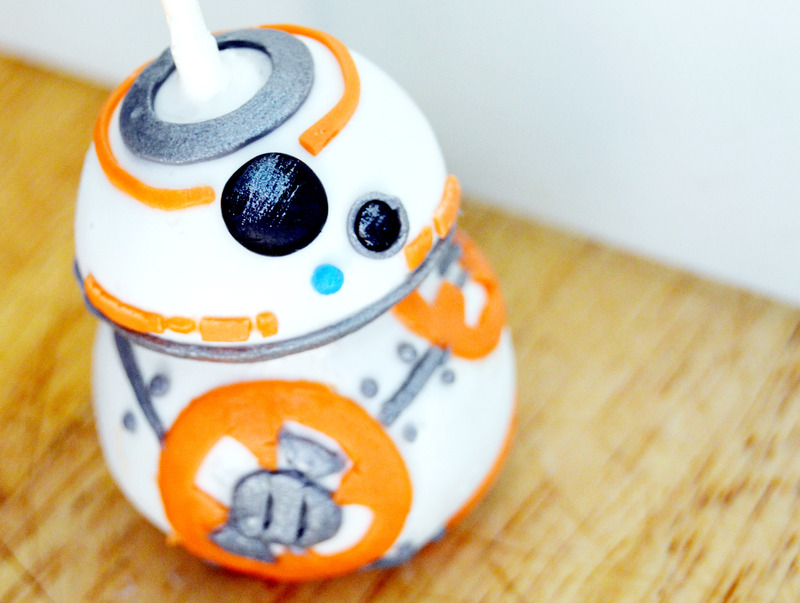 When I saw that they released a BB-8 droid, I was very tempted to buy it. But then what would I do with it? It would probably sit there collecting dust or I could make Bear chase it around. I think I would rather put the money towards a new pair of shoes. But then again, it’s like a functioning mini droid. Ahh… first world problems. Crumble cake to cake crumbs and add in frosting ¼ c. at a time, until you get a play dough consistency. You want to make sure you work in the frosting completely, and that every crumb is mixed evenly. With ¾ of the cake dough, roll 1 ½ tablespoon sized balls. With the ¼ of the cake dough, roll 1 tablespoon sized balls. Chill thoroughly. Remove from fridge and using floss or a sharp knife, cut the 1 tablespoon sized balls in half (this is the head). Melt white candy melts and coat the entire cake pop completely. From this point forward, use the thin paintbrush and water to glue the fondant pieces onto the cake pop. Mix few droplets of vodka into the silver shimmer to create edible silver paint. 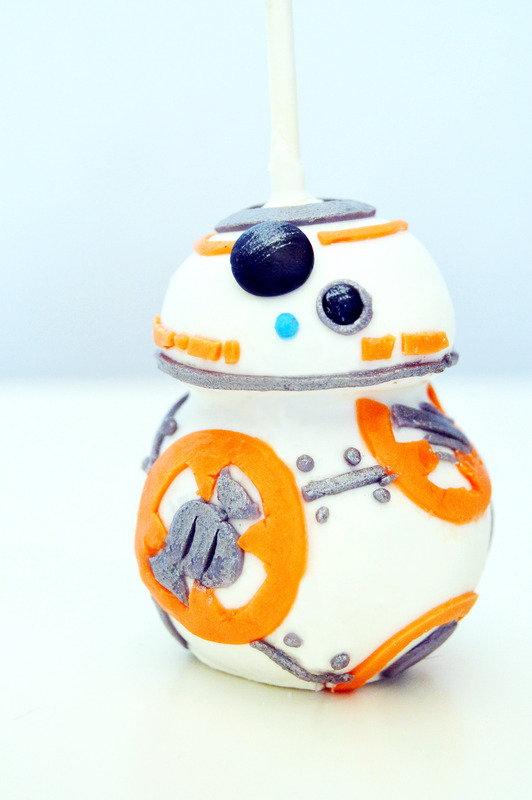 This entry was posted in Cake Pops, Cakes, Desserts, Star Wars, Vanilla and tagged Cake, Cake Pops, dessert, Star Wars, vanilla. Bookmark the permalink. Hang on, let me show this to all my friends, one sec..
My boys would totally love those cake pops. They are all into Star Wars right now. Nice job on the details. It looks exact!